And then...summer arrives. If you're running in high humidity, you sweat. A lot. It's not pretty, and you're draining your body of electrolytes like sodium. On my long runs, I take precautions. I drink special drinks, chew sports snacks that contain electrolytes, etc. But I still crave salt. I used to keep a giant container of pretzels by the bed just to get handful of salt when I needed it! (and PS--my blood pressure is in check. Low, actually!) So I wondered--did I really need that salt I thought I was craving? -Look at your clothes to see how much salt you lose. White crust from salt on your skin? You lose a lot. --Pee after a run? Doesn't necessarily mean you're hydrated. 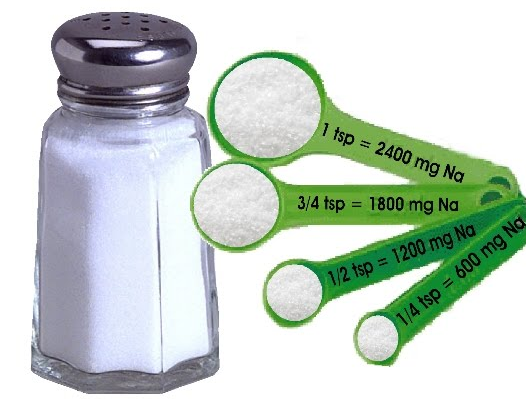 It can mean that you have too little sodium in your body, and you need to compensate by getting rid of some water. So guess what? I guess I just need to listen to my body. After a tough workout I'm covered in chalky white sweat, which means I'm losing a lot of sodium. When my body is craving salt, I'll eat something salty! The rest of the time, I'll stick to meeting the recommended amounts for healthy adults: about one teaspoon each day. Do you pay attention to salt in your diet? Worry about too much/too little? When trying lose weight, I ate as little sodium as possible. Now, I find myself eating lots as it gets hotter and I take my workouts outside. How do you take in salt for long runs? I generally just bring along something like Gu Chews or Shot Blocks, which do have some sodium in them. Often I'm guilty of just bringing along regular jellybeans--which don't have any sodium. I love using nuun instead of plain water, because that has all my electrolytes already. I actually had to pretty much cut salt out of my diet because it aggrevates my Meniere's disease and, according to my sweat, I'm a pretty salting person ;). It's actually nice, because now that I sweat so much running, I don't have as many vertigo episodes because there's not as much salt in my system. Fun how that works out. I do, however, occationally crave salt and then I usually have some pretzels or something along those lines to make up for it. Very informative post. My running partner has the salt crystals on her skin after we run - not me, just a soaking wet shirt. I'll make sure she reads this post! I am def. a salty sweater!!! I also always crave salty snacks (i.e. my favorite snack is chips and salsa), coincidence? I guess I should incorporate more electrolytes but my stomach is very sensitive so a lot of the drinks upset my stomach but Shot Blocks seem to work! I generally try to watch my sodium intake and don't eat a lot of processed foods for that very reason, but I let loose before and after a long run in the summer! I am such a salt junky, but I hate that bloated feeling and the last thing I want to do is jeopardize my health. Good post! I probably get enough salt but it's good to think about :). The craziest thing is after long races, and I can literally see salt on my face / body - proof we lose a TON. Great post! I was wondering why my skin was like that after a run! So good to know! I am such a salty sweater as well. I guess it's a good exfoliator anyways! :) I use gatorade on my long runs to help replace the sodium and GUs as well. I probably should watch my sodium in my diet a little more - it's one I usually don't think about when I look at the nutrition facts. I don't really pay attention while eating, but I know I do eat a lot of salt. I sweat a ton, so I figure if I'm craving salt, I eat it! I know what you mean about restaurant meals though that are off the charts in sodium! I usually rely on gels during long runs, but if I start to get muscle cramps, I know I need some gatorade, stat. I don't pay attention to salt intake nor do I consume extra doses when running. I rarely add it to my food (I prefer pepper), but I have noticed that sometimes I do get crusty. Ew. So I am definitely a salty sweater! In college I concentrated on salt intake a lot more, because my roommie was super concerned about it, but now I don't really think about it ever. Warning...if you do not sweat a lot of salt (like have white lines on your hats/clothes/salt on your face) you might think this tastes gross...I on the other hand LOVE them - I think it is because I lose a lot of salt and absolutely LOVE margaritas! Great post! I definitely learned this lesson the hard way when I fainted due to low electrolyte balances after my first marathon. I am a salty sweater and a lover of salty foods. 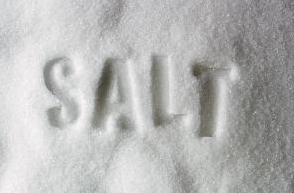 Salt is definitely and important nutrient for distance runners. I took eletrolyte pills during my last marathon and think it made a big difference. I LOVE salt. Love it. Luckily my blood pressure is great so I must not be overdoing it. During these hot summer runs over 5 miles I've got gels, sport beans, and some gatorade. Not sure how much sodium i'm getting back from all that though. This is very interesting. My husband is in good healthy but salts EVERYTHING. I mean EVERYTHING!!! I am curious to see what this means for him now that he has started training with me. He just bought the shot blocks mentioned in the last comment.....I guess we will find out what he thinks Saturday on our long run! I am a very salty sweater, so bad that you can see the crystals on my body after a hot run. I have high cholesterol though so I try to avoid processed and high sodium foods, but after a run like that I try to get some salt back into my body. Pretzels are my go to snack too! I can exfoliate with the salt on my skin after I run in the heat so in the summer I definitely make sure to replenish my elecrolytes. I love NUUN and usually keep something salty like chips or pretzels on hand as a salty treat after a long run. I don't take salt with me though- it is something I've often though about but I've never done it. I haven't paid too much attention to my salt intake until i noticed my crusty skin after a good sweat! I just use Gu and shot blocks but haven't tried anything else. I'm not a big fan on salty things. I never use it when I cook or really crave it. I always considered that a good thing...HA! I tagged you in my post yesterday. Go check it out!! I sweat a ton of salt! Running in the heat makes it so much worse for me, as I have a hard time balancing just how much hydrating to do, since I don't want to be overhydrated, either. I always love how informative your posts are! I don't really watch my salt. I barely eat processed foods and only add it when it's needed while cooking. I can tell the difference when I do eat a particularly salty meal and normally try to cut back the next day as a result. I am such a sweater. In fact, I wish I could be a test model for sunscreen, wicking clothes, etc. I sweat just like my dad- it's super embarrassing. I will go for a 4 mile run and I will look like I just stepped out of the pool! Cool information! Like you, I usually try to avoid excess sodium unless I'm eating out. I try to limit my salt...but when running, especially with all the humidity, I don't put limits on it and I try to listen to my body. Great info, thanks for sharing! Awesome post! I definitely don't pay enough attention to that kind of stuff and have gotten myself in some trouble after losing too much salt and not replacing it properly - bikram yoga every day for a week. I used to avoid salt like crazy, until I started being really good about getting 2-3 litres of water each day. I couldn't figure out why my salt cravings went THROUGH THE ROOF - exactly like all of the things you've outlined above. Thanks for the refresher post - the pee part was interesting, haha. Didn't know that before! How much salt is enough salt. I have a pacemaker and the Cardiologist said that when I run I need to increase my salt to prevent prevasovagal episodes. I've always been a super salty sweater! I like to call myself a "salt lick" without fail, I'm salty everytime, and now that I'm doing more long distance hiking and running, I totally get the salt crystals and salt grit all over my body. I've gotten into a bad habit of actually bringing regular potato chips on a long hike because I'm gluten free. A bag of chips has 6,000 mg of sodium. Yikes! I also like to use, nuun, Gu's and sport beans etc. It's always hard to figure it all out- how much salt is too much etc. And I've also experienced the other end of the spectrum being over hydrated with water and too low on salts. Gatorade doesn't have nearly enough salt to replace the salt lost when you run. Most people who drink Gatorade drink it as a beverage, not as a fluid replacer. If you want to replace the fluids lots while exercising, INCLUDING the electrolytes, make yourself a batch of Oral Rehydration Solution (aka ORS). You can Google it, or just mix 1 teaspoon salt, 6 teaspoons sugar and a quart of water. Receive 5 Star verified winning picks on MLB, NHL, NBA & NFL + Anti-Vegas Smart Money Signals! A Long Run and "Solemates"
Guest Post: Need Some Motivation To Run? Guest Post: Want Guns Like These? Homemade Granola and Giveaway Goodies! Chocolate Whipped Cream = Recovery? Why Yes, I Do Run 87 Miles Per Hour! Weekly Workout Recap and Giveaway Winner!